Watching High Finance romp to second place in the CCI** at the Jersey Fresh International Three-Day Event with Melissa Miller aboard, you’d never know that three years ago the off-the-track Thoroughbred was fighting for his life. The red ribbon at the May 7-11 event in Allentown, N.J., was a testament to Miller’s care of and belief in the 14-year-old gelding. A bout of Potomac Horse Fever, followed by laminitis, threatened High Finance’s life in 2011. Miller, 25, nursed him back to health and soundness. The fight and strength that characterized “Finn’s” recovery from Potomac Horse Fever and laminitis were evident when Miller first sat on him eight years ago. He bolted with her twice, but she and her mother Laura had a good feeling about the ex-racehorse (Peruvian—Centerfold Rebel, Classic Account), originally picked out for a friend. They changed his Jockey Club name, What A Rebel, to High Finance and started to convert him into an event horse. Since Miller is based in Cincinnati, Ohio, she doesn’t have access to many trainers. She trains with Bruce Davidson, Sr., during the winters in Ocala, Fla., and has also worked with Leslie Law. Miller operates her self-started business, Melissa Miller Eventing, solo. Although she’s been teaching lessons since the age of 15, the endeavor became full-time when she graduated from Miami University (Ohio) with a business degree. A big part of her business is finding off-the-track Thoroughbreds from the Fairmount Park (Ill.) and Hoosier Park (Ind.) tracks to train for clients. She rents an aisle of Dancing Horse Farm in Lebanon, Ohio, where she stays busy. 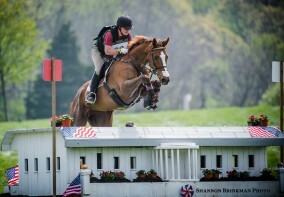 Finn had been jumping around at the intermediate level in early 2011, including earning 10th place at the Jersey Fresh CIC** that May, when at the end of July he showed symptoms of Potomac Horse Fever. “We treated him for about a day and a half at the farm then all the sudden we started noticing the laminitis signs hitting very quickly—actually just within hours,” Miller recalled. Veterinarians treated Finn aggressively as soon as he arrived at Hagyard. “He was so bad that day that we put a third packing on his feet to kind of create a cast to help relieve pressure off the sides,” Miller continued. “So we put that on and he got better for about six hours and then got way worse. And when he got worse he actually went down and they actually thought he was almost dead because he was lying in the stall with no motion. He wouldn’t pick his head up, nothing. Read all the stories from the Jersey Fresh Three-Day Event.